NewYou launched in mid 2018 and operates in the cannabinoid MLM niche. The company is based out of California in the US and headed up by husband and wife co-founders, Ray and Daran Grimm. Ray Grimm Jr. (right) first appeared on BehindMLM in 2017, as President and CEO of Laguna Blends. Laguna Blends marketed hemp products through My Club 8. A few months after My Club 8’s prelaunch, Ray Grimm Jr. disappeared from Laguna Blends’ marketing. Laguna Blends does not appear on Grimm Jr.’s LinkedIn profile, which dates back to 1988. On his personal website, Grimm Jr. does acknowledge his stint at Laguna Blends, but only as a consultant. In 2016, Ray began consulting with Laguna Blends and within a year became President and CEO. Laguna Blends was a CBD-based product company located in Canada that under Ray’s visionary leadership acquired Isodiol, another CBD-based product company located in the US. As a result, Laguna Blend’s stock went from .05 per share to over $2 per share during a two-year period. As per Daran Grimm’s NewYou corporate bio, she started in MLM as an Avon lady. Starting at the age of 17 years old as her neighborhood Avon lady, Daran has had a very successful career in the Direct Sales industry both as a Top Income earning distributor and company owner. Over the last three decades, she helped build three multi-million dollar brands in the health and wellness industry alongside her husband. Read on for a full review of the NewYou MLM opportunity. NewYou market a range of CBD oil products. NewYou claims the CBD oil it uses in its products is 99.7% pure, THC free and organically grown in the US. Cafe Canna, Drops FX, Absorb and Release can also be purchased through Endo30, a $387.50 a month “weight management system”. NewYou’s compensation plan combines retail commissions with a heavy focus on affiliate autoship recruitment. have four retail customers on monthly autoship. For the purpose of commission qualification however, NewYou only counts affiliate purchase PV. There are nine affiliate ranks within the NewYou compensation plan. Alternatively the purchase of a $500 Business Pack qualifies a NewYou affiliate at the Diamond rank for 90 days. The purchase of a $1000 Pro Pack qualifies a NewYou affiliate at the Double Diamond rank for 180 days. NewYou counts GV down only seven unilevel team levels. Also no more than 60% of required GV at any rank is counted from any one unilevel leg. NewYou pays a 10% commission on products purchased by retail customers. The NewYou compensation plan states the 10% is paid out ‘plus retail profit when your Customer purchases NEWYOU products from your website‘, but doesn’t go into specific detail. If a newly recruited NewYou affiliate signs up with an affiliate pack, the recruiting affiliate is paid a recruitment commission. Each NewYou affiliate is required to maintain a monthly autoship order to qualify for commissions. NewYou pays a 10% commission on autoship orders of personally recruited affiliates. NewYou pays residual commissions via a unilevel compensation structure. NewYou caps payable residual commissions at nine unilevel team levels. All NewYou affiliates have the opportunity to qualify for a $1000 Elite Group Bonus. To qualify for the Elite Group Bonus a new NewYou affiliate must generate $3000 in affiliate pack purchases within their first 30 days. Affiliate packs are purchased by newly recruited affiliates. After the first thirty days a $400 Power Team Bonus can be qualified for by generating $3000 in affiliate pack purchases a month. NewYou affiliates can qualify for the Power Team Bonus up to four times a week. If qualified at the Blue Diamond or higher rank, they can qualify for the Power Team Bonus up to eight times a week. Note that no more than 45% of required GV can come from any one unilevel leg. NewYou affiliate membership is $39.95 annually. In addition to bundled products, signing up with a pack provides a new affiliate increased income potential via the NewYou compensation plan. NewYou as an MLM opportunity has a strong focus on affiliate autoship recruitment. The “suggested enrollment options” are ranked from “good” to “best”, over signing up without a pack. This is due to purchase of rank (increased commission potential) and recruitment commissions tied to pack purchase. Both the Team Bonus Volume and Fast Start Bonus are tied to the recruitment of affiliates who sign up with a pack. Mandatory monthly autoship (70 and 150 PV) continues the focus on affiliate autoship recruitment, and is also blatant pay to play. Pay to play is frowned upon by regulators, as it lends itself to inventory loading (affiliates purchasing product to qualify for commissions over genuine consumption). There is no retail focus within NewYou, with an affiliate able to sign up, pay a monthly autoship fee and then max out the compensation plan by recruiting others who do the same. And given pretty much every commission within NewYou is tied to recruitment (retail commissions being the sole exception), this is what’s obviously likely to happen. You should be able to verify this yourself, by comparing how much a potential upline is earning on genuine retail sales each month, versus downline autoship orders (both directly and indirectly recruited affiliates). If retail commissions are dwarfed by downline autoship orders, which I suspect they will be, that NewYou affiliate’s business is operating as a pyramid scheme. With respect to NewYou’s products, although they have different names, some of the products are very close to what was offered through Laguna Blends’ My Club 8. 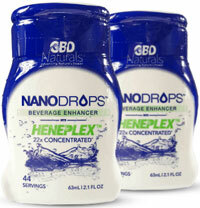 The “beverage enhancer” drops for example appear to be pretty similar, if not the same product under a different name (Laguna Blends marketed Nano Drops for $19.95 a bottle). This isn’t necessarily a bad thing… but bear in mind that My Club 8 collapsed. With similar products, that certainly puts a question mark over retail demand of NewYou’s products. Today Laguna Blends are known as Isodiol. The company still sells the same products offered under My Club 8, only with slightly different product names. Of note is Isodiol also has a white-label division, meaning any company can brand their products. I’m tempted to say this is what NewYou have done but couldn’t find any information to confirm it. Again, not necessarily a bad thing but just be aware that the previous MLM attempt didn’t work out. Whereas My Club 8 had a relatively simple compensation plan, NewYou is heavily tilted toward recruitment. The only reason I can think of to explain that is if NewYou’s CBD oil products don’t hold up on their own. Also, just to make things more confusing, there are still jurisdictions in the US that consider CBD oil and related products schedule I narcotics. The most important of which being the DEA itself. Which, hypothetically, makes all CBD products subject to interdiction. Not that DEA wants to go after the common folks. LMAO… So the crooks from Redding Ca, are still at it! Jane Gallenero Lee & Louis Volpe who were behind the Lean Java Bean/ Valentus are also behind this product!